The Cranfill Sumner & Hartzog Municipalities and Public Entities attorneys work with clients from Murphy to Manteo. 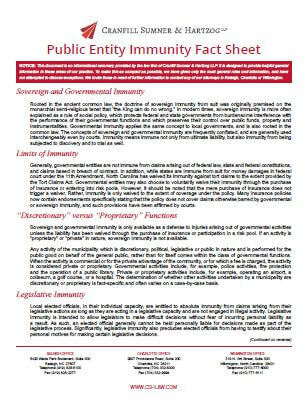 They have assembled an overview of public immunities important for government entities and employees. The document covers sovereign and governmental immunity, limits of immunity, discretionary versus proprietary functions, legislative immunity, qualified immunity, public official immunity, and the public duty doctrine. To access your copy, enter your email in the form below. Enter your email to download Dan Hartzog, Jr.'s "Public Immunity Fact Sheet."